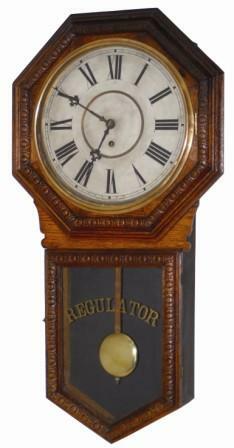 Waterbury Clock Co. hanging clock, "Heron 12 Inch", ca 1906. Fancy pressed oak case with designs around both doors. It has the original finish, some light rubbing/cleaning, but much of the smoke still imbedded in the wood. It is complete and original including the old dial, hands, brass bob, wood stick, and the bottom glass. Top glass is iffy. 8 day, time only movement is signed. The old oak case is 32" high, and of course the old dial is 12", hence the name of the clock. Two partial labels on the back, but they are of little help in identifying the clock. Ly-Waterbury No. 694.